When I was in fourth grade, I was introduced to the horror that is logic puzzles. I’m terrible at them, but I remember the answers like nobody’s business, which has occasionally granted me clues to future logic puzzles. The most famous logic puzzle is, of course, the St. Ives conundrum. The answer, in case you don’t know, is one. Only the protagonist is said to be going to St. Ives. This blew our eight-year-old minds and taught us to listen better to the way the story is told* (well, it taught me, at least). But about ten seconds after you’re told that only one person is going to St. Ives, you realize that we weren’t told the man wasn’t going to St. Ives. Perhaps you met him on the train to St. Ives. Apparently St. Ives is a real place in the Southwest of England^ which you can totally go to. Also, is polygamy legal in Southwest England? ** The man has seven wives. I suppose they could all be dead. Each wife was around for her cat to give birth to exactly seven kittens. How did they ensure that, anyway? Did the cat ever slip up and have too many kittens, at which point the man slaughtered them all, cat and owner alike? What if the cat did the more typical cat thing and give birth to less than seven kittens? Or did the cat give birth to a litter of three and a litter of four, say, and then the owner killed everyone? How did the protagonist meet this man anyway? You see the problem with logic puzzles? As soon as you apply logic to them, they make no sense and you end up crazy. Perhaps the man from St. Ives encountered the Knights and Knaves puzzle. **That would explain — haha! I nearly told you a major plot twist to The Hound of the Baskervilles, which you should totally see! So the last two weekends, I’ve been attending E Street Cinema’s Miyazaki film festival. Every Saturday and Sunday, they show two films from Japan’s Studio Ghibli: a more adult-themed one at 10:30, and a family-friendly showing at 1:30. They change the films every weekend. Last weekend was Nausicaa: Wind in the Valley and then My Neighbor Totoro. This week’s fare was Porco Rosso and Spirited Away. I have now seen enough Miyazaki that I’m picking up on themes on my own, rather than just listening to what my friends say. I can see his take on environmental themes. We’re not here to save the planet, we are here to work with the planet. Also (this might be more of a Japanese trope than a Miyazaki-specific trope), the films are a lot slower than I’m used to seeing in American animation. In Spirited Away, for example, we watched Chihiro walk onto a train, find a seat, sit down in the seat, arrange herself, ensure her friends were comfortable, look at No Face, look next to her, then point at the empty space next to her, then we saw No Face’s reaction, then we watched No Face cross to the seat, then sit down, then we had a moment of them sit silently on the train as it moved. Image unrelated. I just cracked up when the train splashed No Face in the film, because I remembered this .gif. There were a lot of scenes like that, scenes which didn’t advance the plot or develop the characters, yet they held weight and meaning anyway. Not everything that we do every day develops our personalities or our life goals. Chihiro and No Face getting onto the train; Chihiro and Lin eating rice cakes and looking out over the newly-developed ocean; Porco doing loop-de-loops while flying to Milan; Signor Piccolo blowing the roof off of his shed while testing the plane engine; 90% of Nausicaa: Wind in the Valley. These moments do nothing for the story, and yet they felt important. Life is a stretch of quiet moments. We saw our characters go through their loud moments and their quiet moments. It felt important. Walking out of those movies and blinking in the bright sunlight beaming down on E Street, that same contemplation still swimming over me, I realized that it was a gorgeous day and that I had absolutely nothing to do. No one needed me to be anywhere. I had nothing due. The parking lot charged me a flat fee; I paid $10 whether I was there two hours or ten. 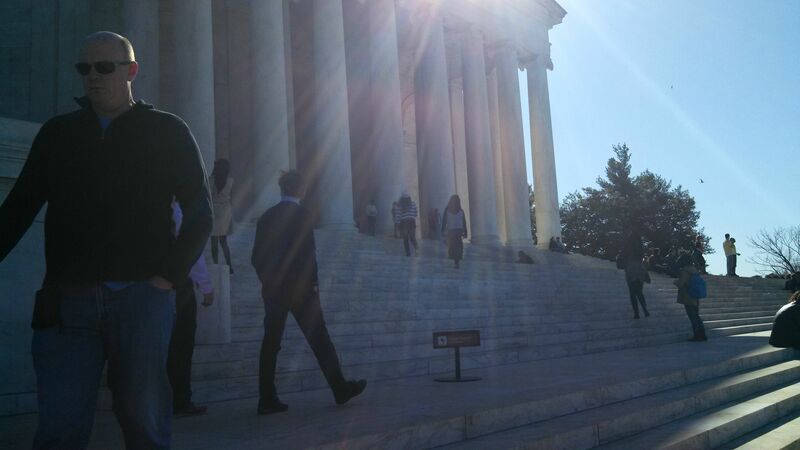 Nothing was stopping me from just being in DC. So I walked to the Sculpture Garden and watched a security guard chase some kids off of a sculpture. Then I walked to the Mall. 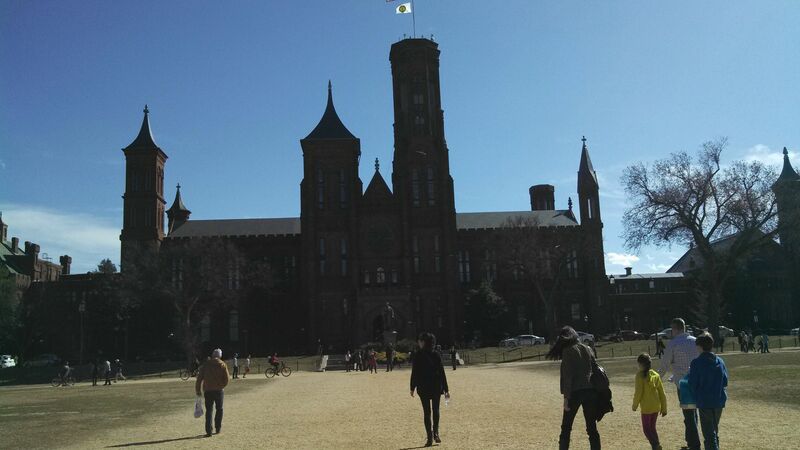 The only real castle that America will ever get, and it’s a damn information desk. Once I was at the Mall, I realized that I had been to the Mall a billion times, so I decided to go to the Thomas Jefferson Memorial. 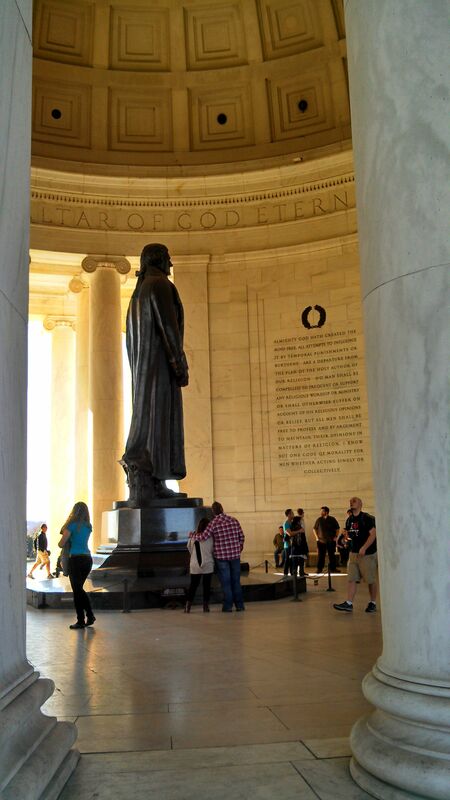 I don’t know if I had ever been to the Thomas Jefferson Memorial before, but if I had, I don’t remember it. So it seemed worth going to, even though I was on 12th Street and had already walked a half-mile just to get to the Mall. 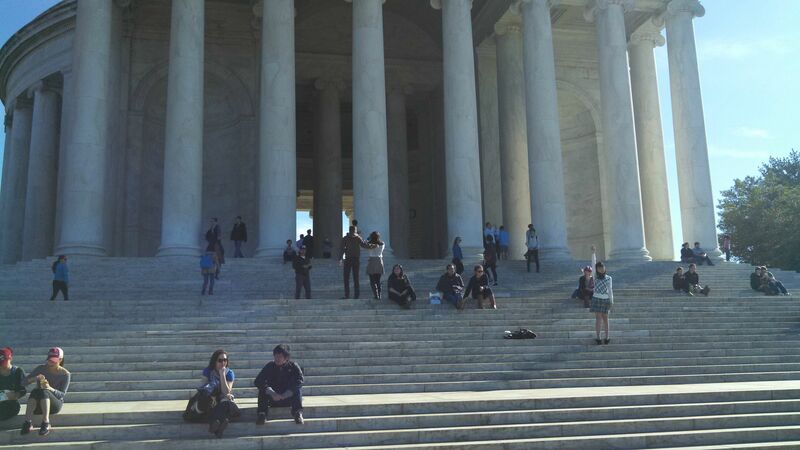 So I walked a mile to the Jefferson Memorial. 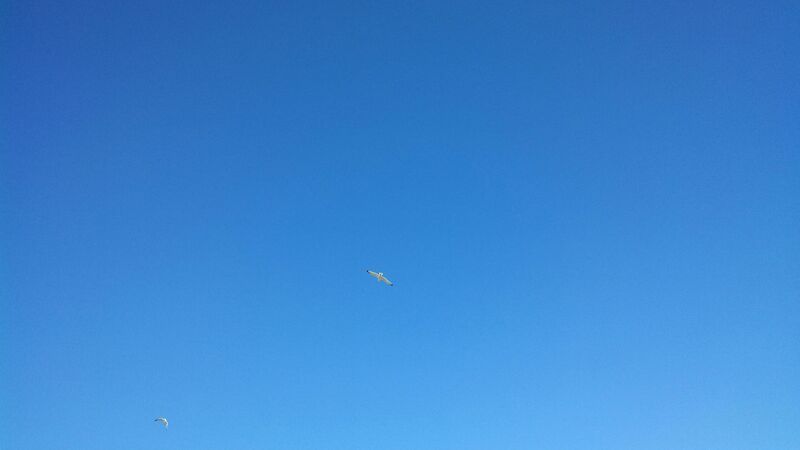 People were flying kites and riding bikes and going for jogs. Tourists were taking photos. The carousel in front of the Air and Space museum was in full swing. 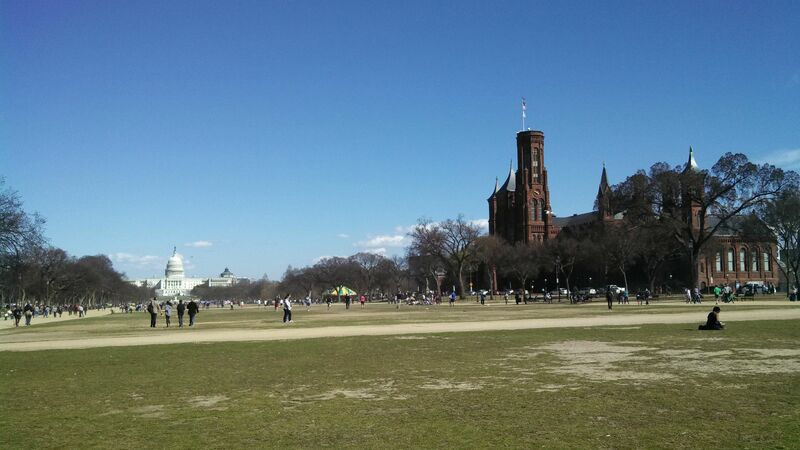 The Washington Memorial had shed about 75% of its scaffolding. I sat down on the grass and tried to get a picture of my finger “touching” the top of the Washington Memorial. The lighting was terrible. I sighed. It all felt like it did in Europe, when I had napped all over the city. I would, regularly, arrive an hour or two ahead of my Rome to Augustus class, find a comfy-looking spot of granite or marble, and nap. I take an odd pride in my ability to nap on public spaces. I didn’t feel much like napping, but I did lay out my coat, tuck my purse under my arm, and close my eyes. I just wanted to feel the sun on my skin for a bit. Just listen to the sound of the city. I could hear the wind; I could hear cars. I could hear scratching nearby. It sounded like feet running near my head. I figured it was just a kid running around and ignored it. The sun shone through my eyelids. I wondered if everything would be blue when I opened my eyes. Someone whispered in my ear. I screamed and sat up. The whisperer was already running away; some white dude in a green-on-white shirt, laughing hysterically. If this were a Miyazaki film, I would have had something angry but funny to say. But I didn’t. I just lay back down and closed my eyes again. But the spell had been broken. Lying on the ground was stupid. I got up, put my jacket back on, tucked my purse over my shoulder, and walked on. Boy Scouts discussed ways to measure the length of the Washington Memorial’s shadow. 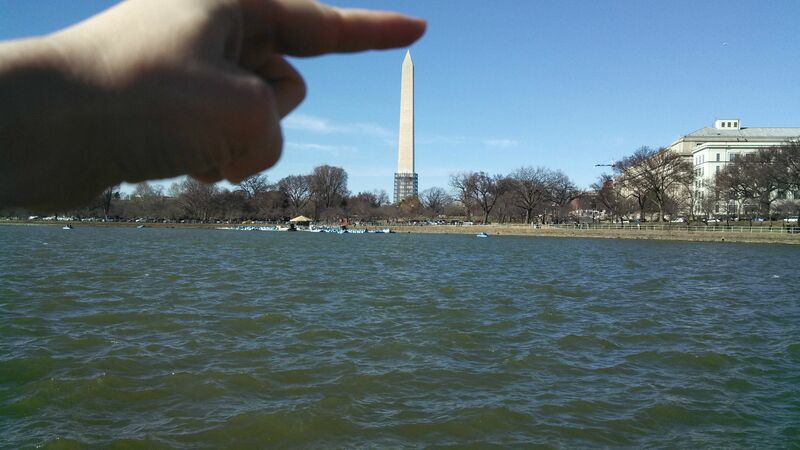 I tried to get another picture of my finger touching the top of the Washington Memorial. Too blurry. 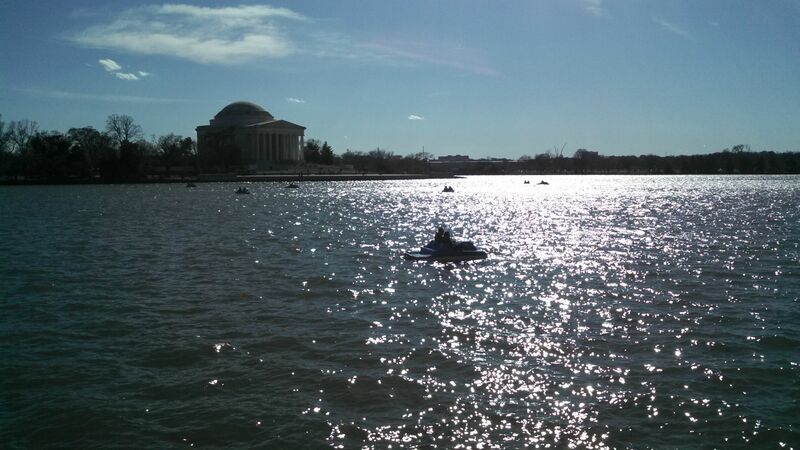 I headed for the Potomac River, and the Jefferson Memorial. I walked along the river. I fell in behind a gay couple discussing couches. They didn’t know what size was right for their living room. Above us were the Japanese Cherry Trees, not yet in blossom. The couple walked off farther down Ohio Street as I turned towards the Jefferson Memorial. Everything seemed to happening way too fast, so I sat down by the river and watched the paddleboats paddle. 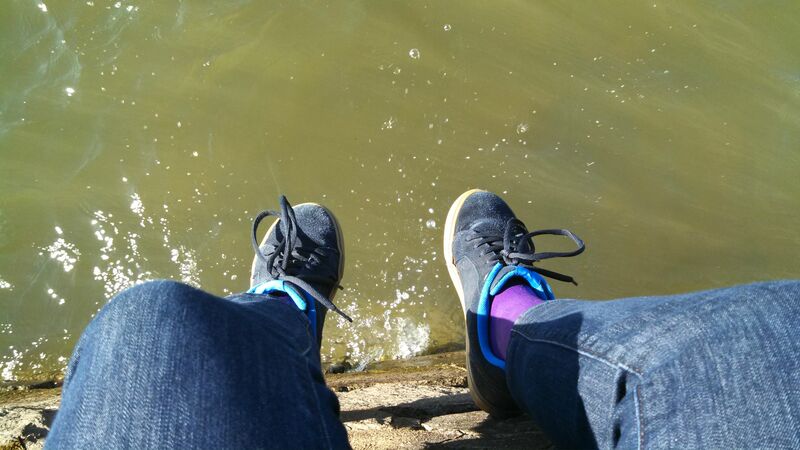 I knew why some parts of the river registered as blue; that was the part of the river that was reflecting the sky. But where did the green come from? There are many mysteries in life. Dissatisfied with my inability to reason why the river looked green, I got up and headed for the Memorial. I looked at the famous Stairs leading up the Memorial thought, hah. I could nap the hell out of those stairs. I didn’t, though. But I could have. I was also delighted by all the people taking pictures of each other. For some reason, one of my favorite things to look at is people taking pictures. Also several people seemed to realize that the normal pose, standing and smiling on the steps, is super boring to look at, so I watched as several different groups had their members pose in odd ways just to jazz up the vacation photos a bit. After a moment I realized that I was staring, so I went inside, feeling a bit like a sheep. Everyone was taking a picture of the statue, but I gawked at the ceiling and the floor. It was exactly like the dome of the Pantheon. Exactly like it. The more I studied the building, the more I realized how much the Memorial resembled the Pantheon. 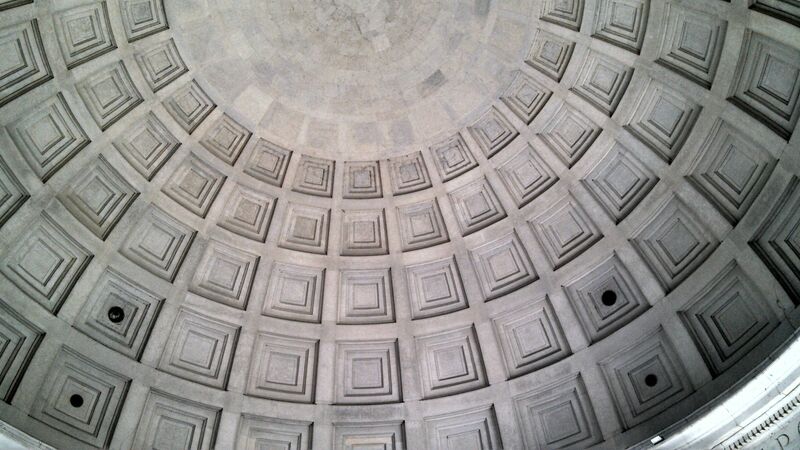 The ceiling was exactly like the Pantheon, except that the Pantheon has a hole in the middle of its roof (on purpose). I looked at the floor. The layout of the white marble was exactly like the layout of the Pantheon’s marble flooring, except ours was all white while the Pantheon’s was a variety of beautiful colors. I looked around; there was seating on the edges instead of random votives, and open views split apart by columns rather than random shrines. But the layout was remarkably similar to the Pantheon. I looked back at the main stairwell. Indeed, exactly where the ancients would have made their sacrifices, that was where there were extra fancy steps and a gigantic marble block. No wonder I felt like I could nap on it. I had totally napped on its cousin in Rome. I didn’t nap on it. 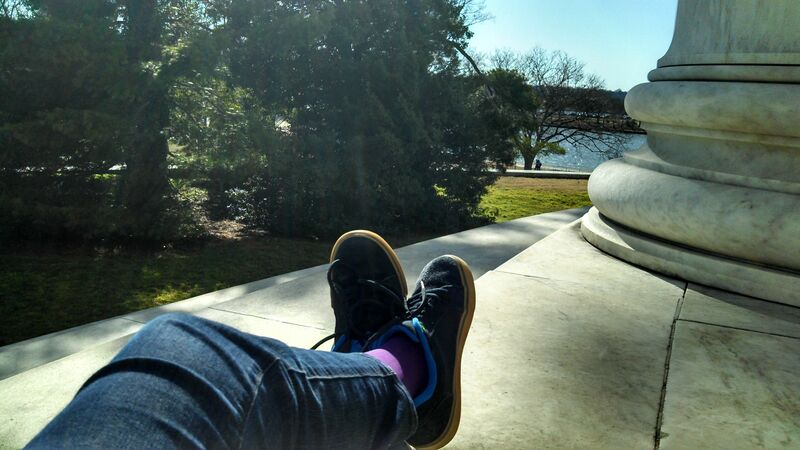 I discovered that the columns were incredibly comfortable for resting against, though. I sat behind the statue, where most tourists didn’t go. The tourists that I did see were in a mood like me. They weren’t chatty. They weren’t filling itineraries or taking pictures. They were looking at the road beyond, at the river, at the nearby trees, at airplanes taking off from Reagan National Airport. We sat in contemplation together. Watching. Waiting. Admiring the quiet moment for what it was. Quiet. I had some notes from the teacher in my hand as the kids and I analyzed this primary source. It was a fantastic exercise. The kids learned a lot, about the Boston Massacre and the use of images as propaganda. They also did real history as opposed to just being told what to think, which is a major plus. But one of the points that the Teacher’s Notes made, which I wasn’t sure what to do with, was the fact that Crispus Attucks is depicted as white in the image. There are three dead men depicted in the engraving. All three are white. Despite its name, only five people died in the Boston Massacre (as opposed to the dozens or hundreds the name implies). Three of the dead were white men, one was a white boy, and the last was Crispus Attucks, a black man. The fact that there are no black men on the engraving at all indicates some rewrite of the facts, but to go so far as to say that Crispus Attucks was turned white for propaganda purposes seems to be going too far. After all, three white men died, back when it was thought that white men were the only people worth noting. The three white men are being shown dying. To me, the boy and the black man were completely ignored. I didn’t mention this thinking to any of the kids. All I did was point out the lack of Crispus Attucks, and slid that right into the demographics of the crowd overall (very peaceful, diverse, and well-dressed for a mob of ropemakers and dockworkers, don’t you think?). The kids jumped right onto the fact that no one in the mob has a weapon. A lesson was learned. It occurred to me today, two weeks later, that Crispus Attucks is the only name I know from the Boston Massacre. How often had I pointed out the Commander of the British regiment to the kids, without knowing his name? I didn’t even know the name of the white men and the boy who had died. Just Crispus Attucks. Which isn’t a bad thing, but this morning, as I stared into the bacon frying in the pan, I suddenly wondered if that was on purpose. Perhaps the Civil Rights movement had something to do with it. What was more important for American schoolchildren to know, the names of each individual person that died at the Boston Massacre, or the fact that there were only five of them? In the grand scheme of things, did we really even need to know their names? And yet, here I was, with this fact. Crispus Attucks died in the Boston Massacre. I didn’t know what his job had been beforehand. I didn’t know how old he had been. All I knew was that he died on March 5, 1770, by British hands. Google has a tool called the Ngram, which tells you how many percentage of books, in each year, included a certain phrase. It’s therefore easy to compare mentions of the Boston Massacre to mentions of Crispus Attucks. The mid-1850s had a sudden spike of interest in the Boston Massacre; possibly because of the impending Civil War and the surge of patriotism in the North and South towards their respective countries. Tellingly, Crispus Attucks’ name was not use proportionally. In other words, most mentions of the Boston Massacre didn’t mention Crispus Attucks. Perhaps they didn’t want to mention that black men were fighting for the American cause from the start, or perhaps, like me, the writers felt that the existence of the five victims was more important than their individual names. Or perhaps the Boston Massacre was just a name, a reference in American society, the same way we talk about the Boston Tea Party as an example of rebellion without mentioning what the participants actually did. Crispus Attucks and the Boston Massacre don’t sync up until the post-WWII era, when the Civil Rights movement kicked off. Look at how neat that is. From 1940 onwards, Crispus Attucks isn’t always mentioned, but interest in him surges and plummets at the same rate that interest rises and falls in the the Boston Massacre in general. I think my theory is correct: I only know the name of Crispus Attucks because of the efforts of the Civil Rights movement. Still, a simple Google search pulled up all of the names of the Boston Massacre victims. I wondered what the story would be. Would Crispus Attucks be excluded from the narrative? Would the four white people have been mentioned while excluding the black man? The results turned out to be an absolute mess, so I sorted them a bit. James Caldwell was the name of a prominent Irish baronet who lived from 1722-1784. He served in the Army and wrote a book or two. In a few places, interest in his name surges at the same rate as the Boston Massacre, but not enough to make me think that the James Caldwell mentioned is the dead Bostonian. The last three rarely sync up with the Boston Massacre. Perhaps some books mention them, but not always? Only Crispus Attucks seems to be directly linked to the Boston Massacre, and that looks to be the result of the Boston Massacre. Crispus Attucks was born into slavery in 1723 Massachussetts to Prince Younger, a black slave and a local Indian, Nancy Natick. In September 1750 he escaped captivity. He was 6’2, and knock-kneed, and made a living for himself in and out of Boston Harbor, first working on whaling ships and then later as a ropemaker. He was part of the mob that started a fight with a lone British soldier outside a pub. He was the first one killed. James Caldwell was born in 1753. He was not from Boston; he had only recently arrived on a ship, the merchant ship Hawk. Very little else is known about him. He was part of the mob that started the fight, and was the third to die. Patrick Carr was born in 1740 in Ireland. He was not part of the mob, but instead ran to help. He was shot in the abdomen crossing the street. It took him nine days to die of his wound, during which time he gave a testimony of what happened, and notably forgave the British soldiers who opened fire. Sam Adams therefore denounced him as a papist. He died on March 14, 1770, the last to die. Samuel Gray was born in 1718 and was a professional ropemaker. He was apparently always starting fights, and had the previous week started a fight with some British soldiers. Two of those same soldiers had reappeared during the fight, as reinforcements for the British sentry the mob had happened upon. He was the first person fired upon, although he was not the first to die. Matthew Kilroy was one of the soldiers Samuel Gray had fought with the week before. He ended up killing Gray. He was later convicted of murder. John Maverick was born in 1753, a local apprentice to Isaac Greenwood. He was not part of the mob that started the fight, but was instead called over by the bells and hubbub. He and his friend, John Greenwood, assumed it was a fire and ran to help. The two boys got separated in the fight. Maverick may not have started the fight, but when the British soldiers raised their guns in fear, he shouted, “Fire away!”, indicating that he probably got wrapped up in the revolutionary spirit/mob mentality. He died of his wounds on March 6. Edward Montgomery stumbled a bit, whether it was from slipping on ice, or getting his with a stick or a snowball. He was the first person to fire, although whether he fired on purpose or accidentally is left for debate. He was apparently heard shouting for the other soldiers to fire. Captain Thomas Preston was born around 1722, and was probably Irish. He was Captain of the Guard that day. Upon hearing that a mob was looking to attack and kill a sentryman, he sent about 12 men to the sentry’s aid, and then went to the mob himself. He claimed to have stood between the mob and his soldiers himself. He was found Not Guilty, but soon after left the army and returned to the British Isles.